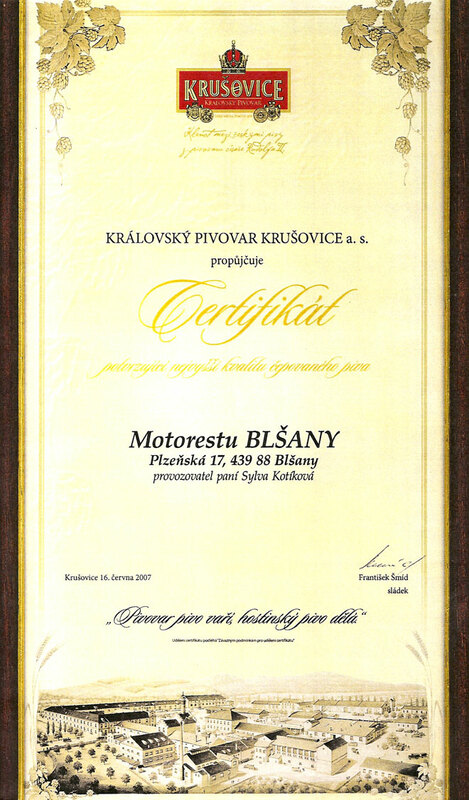 Welcome to Hotel & Motorest in Blšany! You can find the Hotel & Motorest V Údolí Zlatého potoka *** right in the centre of picturesque town of Blšany, which the international road I/27(E53) passes through and going directly from austrian borders throuhg Plzeň and Žatec until borders with Germany. It can reliably provide comfort of hotel background in recently reconstructed rooms and restaurant on your business trips as well as on your vacation. 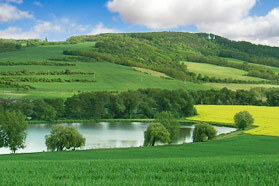 Thanks its position in the centre of important hop breeding area it offers you wide choice of new experiences being your target historical sihgtseeing, cykle-hiking, agro-hiking or passion for beer. Especially for beer supporters this region provides a lot off occations for its closer discovering You can visit Hop museum, Hop and Beer temple, or Hop and Beer feast Dočesná (in nearby Zatec), visit the brewery or taste this beverage in our restaurant, holder of CERTIFICATE confirming the highest quality of draught beer, awarded by Royal Brewery of Krušovice to elected ventures, which the products are sold in. To our guests we can offer not only double and triple rooms and apartments for 4 and 5 persons, but also one barrier-free room for 2 persons. Each room is equiped by own bathroom and toalet, television, dvd player, telephone and internet. We also offer guarded car parking in the hotel area and bike rental. Our restaurant provides a pleasant place with wide range of dishes not only from czech cuisine and there is also wonderful fireplace in the wine bar. In the peak season the restaurant is diversificated by summer terrace. 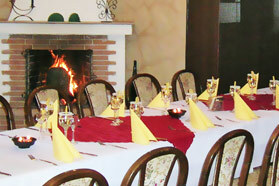 The hotel guests can order from traditional menu of three diet forms – breakfast, half board and full board. Each room has its own bathroom, toilet, TV, SAT, DVD player, telephone and internet. We offer wide possibilites of diet, non-barrier access, possibilities of cyklo-hiking, agro-hiking, bike rental and guarded car parking directly in the hotel area. If you have a dog, feel free to bring it with you! We accept credit cards VISA, EUROCARD - MASTERCARD, AMERICAN EXPRESS, JCB CARDS. 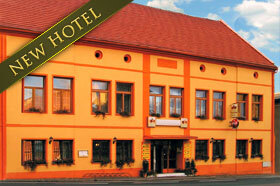 The Hotel is a member of Association of hotels and restaurants of the Czech republic with rating of three stars.